My reading style has changed this year. Not so much what I read, but how I read. I posted a few weeks ago about some of the podcasts that I’ve fallen for and mentioned that listening to podcasts has severely cut into the time I used to spend listening to audio books. A quick glance to compare this year’s reading list to last year’s reading list and the change is obvious. I’ve pondered this diversion, felt a tinge of guilt about it, and pondered it more. Where I’ve landed is that ultimately, I’m OK with the change. Many of the podcasts I’m listening too, if they aren’t completely focused on books, refer to books often. And in some ways, this is as fulfilling as listening to an audio book. It’s like listening in on a book club discussion, which as most readers agree, adds to the personal experience of reading. But to be OK with reading fewer books makes want to be more intentional about the books I DO choose to read. My ultimate goal is to spend more time reading quality – books that are really good. Which is what this post is really about. I have an out of control TBR list. At the same time, the book that I’m typically currently reading tends to be not from that list but a new one that I’ve picked up. So, it feels like the TBR pile grows and grows, and I’m never making progress. (Those bookish podcasts – yeah, they don’t help on this front either.) But when I look at the books on my Goodreads TBR list, I’m reminded about those selections that I really do want to pick up. So, I’m trying something new. In early September I figured out that I want to read at least 16 more books in 2017. That’s approximately a book a week – very doable. 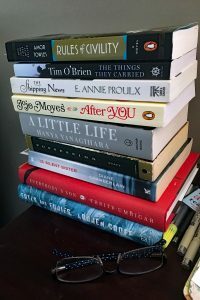 I went through my shelves, my Kindle, my book club’s selections and my Goodreads TBR list and picked out 12 books to commit to reading in the next four months. (Two are re-reads.) That leaves room for four others that just get picked up. Of the ones I own, I pulled from my shelves and made a stack. I made a list of all twelve on my white board, and when I start a new one, it moves from one side to the other. And I set a daily reading goal to keep me on pace – at least 14% of a book each day. So far, it is working. I’ve finished five and am nearly half way through two more. 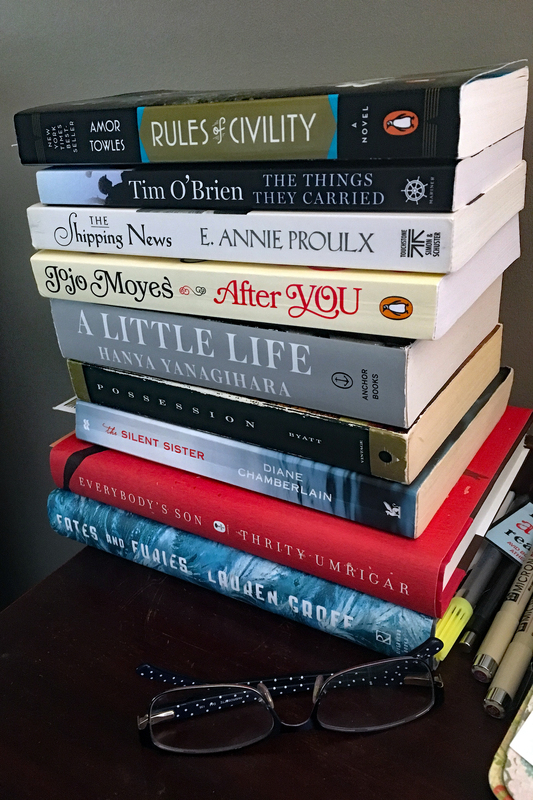 I’m hoping that when the end of December comes, even if I haven’t read as much, I’ll feel satisfied with what I’ve accomplished and (perhaps) will feel some semblance of control of that pesky TBR pile.